Russia got out of the dark ages long before the rest of Europe. The rest of the west got out of the dark ages, due to the age of enlightenment of the 17th century. Due to Mongol rule, Russia got out of the dark ages, by 13~14th century. The Russian people of that time, thought of the Mongols as gods, this is because, during that time, Asia have technology centuries ahead of the west, it allow the Mongols to mobilize and transport large army quickly and effectively, over a much shorter period of time, in comparison to the west, also, in term of weapon and the fact Mongols troops was better trained, a single Mongol soldier of that time worth at least 3~5 European soldiers. Take a look at the weapon, Asia's military at the time, had early rockets, which was an arrow with a rocket propelled and a grenade attached to it, it has a range of 800 meters, all western shield and armor was useless against it. Long range bow has a 300-meter max range, early pistols known as a hand cannon, early bayonet, which is a pistol attached to a short spear. land mine, hand grenades and broad swords. 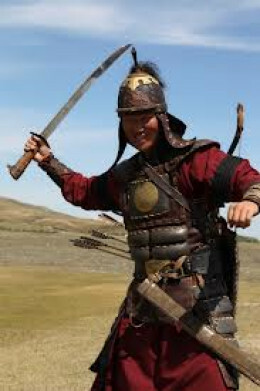 Unique to Mongols is their horses, was the best of the time, Mongols are excellent horse breeders and Mongols all know how to ride horses very well, giving their military additional flexibility. Europe in the time, had templar that use long sword and shield, calvary with nothing but a wooden lance, archer that fire a max range of 100 meters and extremely heavy catapolop that is not mobile. The knight, despite suppose to ride horses, frequently ride donkeys or cows, because a lack of horses. The European armour, facing Mongol rocket and cannon bombardment, the soldiers frequently, get burned alive by their own armour, due to the heat from the Mongol cannons. What are the similiarites between the Mongol and Nazi invasion of Russia?